Transformers for switching power converters are typically constructed with discrete circuit components in SIMPLIS. The saturation effects of the transformer are modeled with a PWL inductor, and the leakage inductance parasitics are typically lumped into a single leakage inductor. It is important to note that this leakage inductor must not be treated as an ideal inductor or possible slow simulation results will occur. Instead, a "Lossy Inductor" is used which has a resistor in parallel with the inductance. 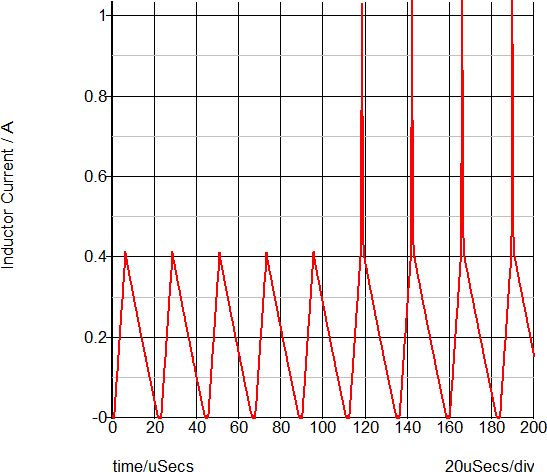 The resistor limits the smallest time constant present in the circuit by limiting the L/R time constant. 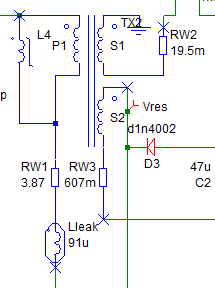 The winding resistances are modeled with one resistor per winding. The following example is taken from the self oscillating converter. 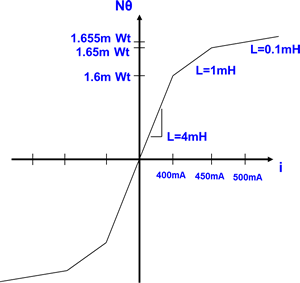 L4 is based on the SIMPLIS primitive PWL inductor, which has the points defined on a X-Y plane. Download the schematic zip file. Unzip and open the schematic. Run the simulation by pressing F9. Confirm the expected saturation at about 400mA.